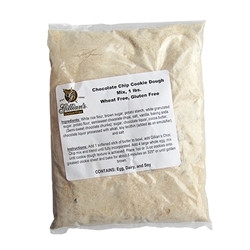 Gluten free chocolate chip cookie mix by Gillian's. Only requires butter and an egg to make 16 - 1 oz cookies. Ingredients: white rice flour, brown sugar, potato starch, white granulated sugar, potato flour, semisweet chocolate chips (sugar, chocolate liquor, cocoa, butter, soy lecithin and vanilla), salt and baking soda.